The IOUG, OAUG and Quest kicked off Collaborate 2011 today with its deep dive sessions. I just landed in Orlando a couple hours ago, so I wasn’t able to attend any. If any of you out there have any comments on them, let me know. Collaborate runs through Thursday with hundreds upon hundreds of sessions on Oracle Database, MySQL, Fusion Applications, E-Business Suite, PeopleSoft, and on and on and on and on. I’m looking forward to hitting some technical sessions, hearing the keynotes, and updating everyone on the breaking news coming out of the show. Speaking of which, I want to make sure that you are all aware of SearchOracle.com’s coverage of Collaborate 2011. We have a landing page that we’ll be updating all week as I write stories and blogs and conduct video interviews with people like IOUG President Andrew Flower, OAUG President Mark Clark, and Oracle Senior Vice President Steve Miranda. If you’re at the show this week and want to meet up, drop me a line at mfontecchio@techtarget.com. If you’re not but have some questions for Oracle that you’d like me to ask, please email me as well. But remember to check in all week on our Collaborate 2011 special report. The Oracle Database 11.2 Express Edition beta has now been released and can be downloaded. Oracle Database XE, as it’s called, is a stripped-down, free version of Oracle Database. Oracle released the paid version of 11g in 2007. Oracle Database XE allows companies to try out Oracle Database before trying it, or to do development on the platform without paying for it. As such, it has significant limitations, as stated in its documentation. No more than 11GB of data can be placed in it, and it can use no more than 1GB of RAM. It is also short of several high-availability, scalability and security features. James Gosling on his blog announced today that he’ll be taking a job at Google. The father of Java and a longtime Sun Microsystems employee, Gosling left the company once it was acquired by Oracle. In the process, Gosling didn’t pull many punches in his criticism of Oracle and how it was handling the acquisition and integration of Sun technologies. Through some odd twists in the road over the past year, and a tardis encountered along the way, I find myself starting employment at Google today. One of the toughest things about life is making choices. I had a hard time saying “no” to a bunch of other excellent possibilities. I find it odd that this time I’m taking the road more travelled by, but it looks like interesting fun with huge leverage. I don’t know what I’ll be working on. I expect it’ll be a bit of everything, seasoned with a large dose of grumpy curmudgeon. “Grumpy curmudgeon” is a good way to describe Gosling’s appearance at TheServerSide Java Symposium earlier this month, where he riffed on topics such as Java, cloud computing and social media. Of course, probably most interesting about this news is that back in August, Oracle sued Google over Google’s use of Java. And now the father of Java is on Google’s side. There has been a lot of speculation around that lawsuit, including the claim that Google will end up owning Java as a result of the lawsuit. Are Oracle Exadata and Exalogic selling as well as Oracle says? During Thursday’s quarterly earnings call, Oracle executives gave a positive outlook to all of Oracle’s revenues. But there was much talk around Oracle Exadata and Exalogic, the company’s integrated database and middleware machines, respectively. Since Oracle has been pushing these appliances hard to customers, the question becomes: Are they selling? First, a few quotes from the call. In the U.S. Securities and Exchange Commission (SEC) filing Oracle filed for the quarter, it showed that Oracle’s hardware revenue increased 263% year over year. Wow, that seems great, doesn’t it? I guess, but you have to remember that it compares to the same quarter last year. That quarter was a time of turmoil, when Sun was on its last legs and Oracle had just acquired it. 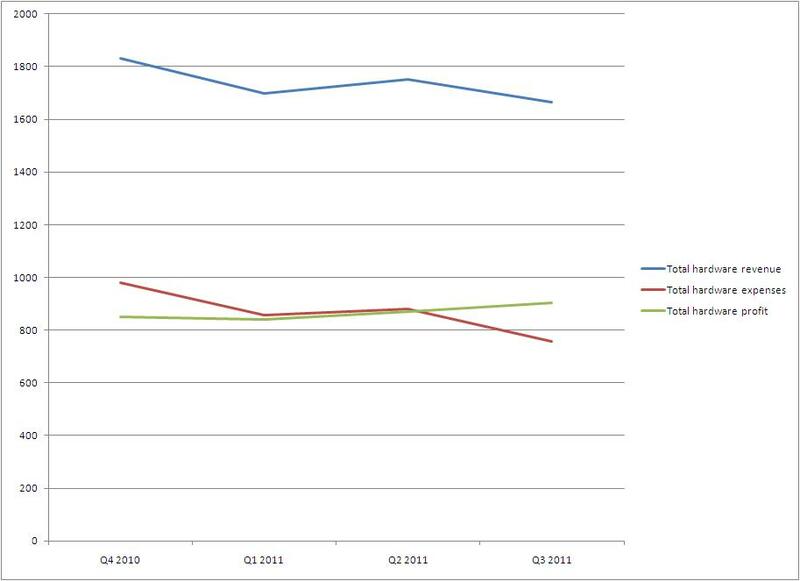 As you can see, hardware revenues are down. But hardware profits are up. Why? Because Oracle has slashed operating expenses on the hardware side, both with systems and support. Over the last four quarters, Oracle hardware revenue has gone down 9%. But hardware expenses have dropped almost 23%. The result? Hardware profits are up about 6.5% over the last four quarters. Now those are total hardware revenues. Oracle isn’t just selling Exadata and Exalogic. It is still selling commodity x86 and Sparc servers. And Oracle doesn’t break down the numbers specifically enough to know what servers are selling and which aren’t. So it’s possible that Exadata and Exalogic are selling while their commodity x86 and Sparc hardware are dive-bombing. What we do know is that Oracle’s hardware revenue overall has declined over the last year. For more perspective, check out my colleague Barb Darrow’s post about how Oracle hardware remains a mystery over at the Channel Marker blog. Oracle announced this morning that it is stopping all software development for the Intel Itanium processor. It’s no surprise. “Intel management made it clear that their strategic focus is on their x86 microprocessor and that Itanium was nearing the end of its life,” the Oracle press release reads. Intel thus far is denying Oracle’s claims, according to PC World. If you run Oracle on Itanium or did at one time and migrated off, let me know at mfontecchio@techtarget.com. I’d like to hear your story. The news that Itanium – called “Itanic” first by The Register and then later by just about everyone other than Intel – might be dying comes as no surprise. Intel’s x86 processors have been constantly improving while releases of Itanium have been delayed time after time. Itanium was primarily used in large HP Unix servers running HP-UX. That said, the most recent Gartner server numbers showed that IBM was the leader in RISC and Itanium Unix server sales with its Power-based servers, followed by Itanium-based HP and then, in third, Oracle’s Sparc-based servers. “Oracle will continue to provide customers with support for existing versions of Oracle software products that already run on Itanium,” the release states. But the intention is clear. If you’re running Oracle on Itanium, it’s time to develop a timeline for migrating off if you haven’t already done so. Chris Kanaracus at IDG has a good story about how many Oracle customers will see Oracle support cost changes this year. The change is due to many Oracle products moving off Premier Support and going into Extended Support and beyond. Support deadlines have been a hot topic among members of the Oracle Applications Users Group (OAUG), and will surely also be at the group’s Collaborate 11 conference in April, said John Schmitz, who serves on the organization’s Customer Support Council. Oracle recently made a “big step forward” in this direction with the release of a number of detailed guides that walk customers through specific upgrade processes, Schmitz said. Also check out SearchOracle.com’s recent story on whether the phrase Oracle Support is an oxymoron, and readers’ reactions to that story. Gartner’s recent server numbers for the fourth quarter of 2010 show a stark difference between Oracle and the rest of the major server hardware vendors. Just about everyone else’s revenue is rising while Oracle’s continues to drop. As we’ve written before, it’s difficult to gauge exactly how Oracle is doing until it has had a full year with Sun Microsystems under its helm. But it’s safe to say that Oracle has a lot of climbing to do if it expects to challenge IBM, HP and Dell in the server hardware realm. Its market share has dwindled both in terms of revenue and shipments. This reminds me of when I used to write about the IBM i, previously called the AS/400 and the iSeries. In the last few years, while every other server hardware was seeing revenue increases at IBM (including x86, Power and mainframes), the IBM i continued to drop and drop and drop. Infosys last fall became a diamond-level partner of Oracle, the highest level that can be obtained. The company, based in India, has 25,000 Oracle consultants stationed around the world. Recently I had a chance to talk to Ravi Kumar S., the VP and worldwide head of Infosys’ Oracle practice. We started out talking about what the heck Oracle is doing in the cloud, followed by discussions of Fusion Applications and integrated server appliances such as Exadata, Exalogic, and the prospect of future integrated products. So let’s start with you just talking about what’s happening with Oracle cloud computing. Certainly Oracle has put their cloud story in two parts: infrastructure of the cloud and applications in the cloud. What they’ve done is taken appliances in the cloud and they are turning that into an infrastructure. They’ve also created and put up various test/dev applications on Amazon EC2. That’s the applications side. You will probably also see at some time that Oracle will develop a cloud development platform, something similar to Microsoft Azure. There is no doubt in my mind that Oracle owning Java, along with Sun infrastructure and hardware, that they have a great opportunity to build a cloud development platform. You mentioned applications in the cloud. What about the upcoming Fusion Applications? The Fusion Applications Suite coming up for GA this year is a very cloud-enabled application. Infosys is a large development partner of Fusion Applications. We have a team working in Oracle Labs. With Fusion Applications, you will get the same functionality with the cloud application that you would get with the offline application. Oracle is building it from scratch and they know it will take time for Fusion to build momentum in the market. The initial feedback on Fusion is that a lot of early adopters aren’t looking at fully blown Fusion Applications but at bolt-on applications. To give an example, I have a few customers who have said they don’t want to dislodge E-Business Suite, so they would want Fusion Applications to coexist with their E-Business Suite application. So that’s a great opportunity to try something in the cloud. Existing Oracle applications such as E-Business Suite or Peoplesoft can coexist with Fusion Applications, which could be in the cloud. Where do Exadata and Exalogic fit in all this? Well, Exadata is a database appliance and Exalogic is a middleware appliance. There are many different moving parts in the cloud – infrastructure, applications, network bandwidth, security and so on. If you are bundling it all up into an appliance, you’re reducing the moving parts, which makes it better for a cloud deployment. So if Exadata is a database appliance and Exalogic is a middleware appliance, is there an Oracle application appliance coming soon? There isn’t any direction I have seen yet, but they have all the moving parts to make one. They have the hardware, the middleware, the database and the application. Logically they could do one. Then the number of parts would go down further. This week WealthEngine, a wealth research firm based in Maryland, went live with Oracle Exadata, a quarter-rack configuration that its VP of IT said is much faster than the x86 Dell boxes it was using before. WealthEngine helps organizations find individuals who might make donations. So, for example, WealthEngine can help a university find people in its alumni database who have significant-enough wealth to make a healthy donation to the school. The company’s been around in one form or another for almost 20 years. The company is experiencing some serious growth, both in revenue and data. Its revenue grew 30% in 2009, 40% last year, and is expected to grow another 50% this year. Meanwhile, its 2.5-terabyte database is double what it was last year. It probably won’t double again this year, but it will still “grow significantly,” said Silas Matteson, senior VP of IT. Matteson joined WealthEngine in June and was given the task of “taking it to the next level from a user perspective.” That meant new offerings for its 2,500-plus clients. So WealthEngine now has three ways to deliver results to its customers. The first is online, where clients can do searches one at a time. The other, also online, allows clients to submit up to 6,000 records for bulk searching, with a 2-hour turnaround time. With the third, a client can send them its entire database, which could be millions of records. WealthEngine has a turnaround of 15 days. To accommodate those deadlines and grow its client base, Matteson said WealthEngine had to get a stronger engine. That’s why it went with Exadata. Starting this week, the Exadata will start consolidating the 35 different data sources WealthEngine uses into four major “pointer” files: one on people, one with addresses, one with organizations, and one cross-mapping everything. By the end of April, Matteson hopes to know when those four data files will be ready. And then Matteson said by September WealthEngine will roll out the new version of its services, powered by Exadata. “I would envision at some point, the end of 2012 or later, I think Exadata will be the underpinnings of all our processing because of its speed,” Matteson said. According to Steven Chan, senior Oracle applications director, all EBS 12.0 customers “must apply the EBS 12.0.6 Release Update Pack, technology stack infrastructure updates, and updates for EBS products if they’re shared or fully-installed” to be eligible for Extended Support. 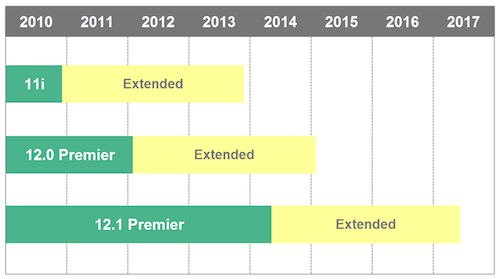 As you can see, Extended Support for EBS 12.0 starts just a year from now. This affects Financials, Human Resources, Process Manufacturing, Service and Supply Chain Planning.